The first blockbuster exhibition in the UK for more than a hundred years of the late Spanish painter Joaquín Sorolla (1863–1923) is currently on at the National Gallery in London (until 7 July). Blanca Pons-Sorolla is the artist’s great granddaughter and leading specialist. She is also the co-curator of the exhibition in collaboration with Chris Riopelle, Curator of post-1800 Paintings at the National Gallery. She welcomes me at the Sorolla Museum in Madrid, housed in the home he built for his beloved wife, muse and model, Clotilde García del Castillo, who bequeathed the family house and her personal collection to the State after his death. The house is now a delightful national museum dedicated to his memory. Blanca is the grand-daughter of Joaquín and Clotilde’s eldest daughter, María, and guardian of his memory. Standing in front of María’s paintings is filled with emotion. 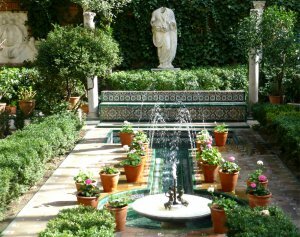 The Sorolla Museum feels less like a traditional museum than a lived-in home and painter’s studio. There are no barriers fencing off the paintings. Family photographs, books, ceramics and curiosities are displayed throughout the house, many of which are gifts from friends and fellow artists. The main living room has a beautiful wooden staircase, which leads up to the former bedrooms, now a space for temporary exhibitions. A large glass rotunda, opens on to the garden, designed by the artist himself. The garden was central to Sorolla’s life, a place of inspiration and rest, providing a setting where nature, water and light combined with the painter’s genius. Our conversation explores Sorolla’s work, his relevance throughout the world and the detailed preparations involved in arranging the long-awaited exhibition in London. Q. Blanca, as well as his great-granddaughter, you are the leading specialist in the work of the painter Joaquín Sorolla.So give us a brief profile of Sorolla. A. Joaquín Sorolla is one of the greatest painters of all time. From the beginning of his career he dreamed of becoming a great international artist. After training at the School of Fine Arts of San Carlos de Valencia and studying Velázquez especially at the Prado Museum, at the age of 23 he continued his training in Italy and visited Paris for the first time, where he was dazzled by the artistic environment, declaring himself an absolute follower of the pictorial naturalism that was happening there. After years of work and preparation, he began to present his works at the Paris Salon, and at the major international competitions in Munich, Berlin and Vienna, as well as at the Venice Biennale, and at the National Exhibitions held in Madrid. Many prizes followed, culminating with a Grand Prix at the Universal Exhibition of Paris in 1900 and the medal of honor at the National Exhibition of Madrid in 1901. His advances from that moment on were surprising. His successes at the Salon de Paris in 1905 would encourage him to face new pictorial challenges that summer in Jávea on the light and color of the sea, especially in the reflections of water, with prodigious results. In 1906 he opened with great success his first major solo exhibition at the Georges Petit Gallery in Paris. The following year a new solo exhibition toured the galleries of Edward Schulte in Berlin, Düsseldorf and Cologne. And, already a great painter, he appeared again at the Grafton Galleries in London in 1908. These exhibitions would be followed by New York, Buffalo and Boston in 1909, sponsored by The Hispanic Society of America, which would achieve unprecedented success; the number of visitors, the sales and the commissions of portraits greatly surpassed the painter’s expectations. In 1911 he repeated his experience in San Luis and Chicago, with the same sponsorship and similar successes. A large commission, Vision of Spain, for the library of the Hispanic Society in New York, would occupy much of his last years. Throughout 1912 Sorolla travelled throughout the peninsula documenting the types, landscapes and customs of each region. Between 1913 and 1919 he painted again in each region the thirteen large panels of 3.50 meters high by a perimeter of almost 70 meters that make up this decoration. In those years, in addition to continuing to develop his role as a portraitist, he painted innumerable Andalusian gardens and, above all, those of his home. Also from those years come some of his beach works of higher quality, made during the summers of 1915 and 1916. A stroke would remove Sorolla from painting in 1920. Q. 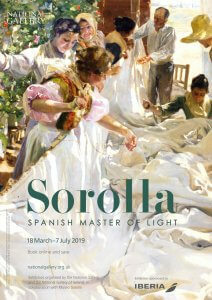 The last monographic exhibition of Sorolla in the UK was in 1908 at the Grafton Galleries in Mayfair, London. Tell us, how was that exhibition put together? A. Already in 1905, perhaps due to the great success that Sorolla obtained in the Salon of Paris that year, the British critic and historian Dr. George Charles Williamson, commented that John S. Sargent took a particular interest in the exhibition. A few months later, in February 1906, it was the Knoedler & Co Gallery in London that was also requesting an exhibition. After the success in Paris in 1906 there was further interest, this time in an exhibition in London, but it would not be until after presenting the new exhibitions in Germany, that Sorolla exhibited at the Grafton Galleries, in 1908. The Galleries in London were splendid, much better than those of Paris, according to Sorolla.It was inaugurated with great success and with many visitors. Q. That exhibition, was it an overnight wonder or did it have consequences in the medium and long term? A. In that exhibition there was an exceptional event, in which Sorolla found ‘the God-Man’, the Hispanic American millionaire, Archer Milton Huntington, who was enthusiastic about his work, bought two paintings and proposed to take his paintings to the United States to the recently inaugurated Hispanic Society of America. Thus, at the beginning of January 1909, Sorolla turned up with the 350 paintings that would be hung on the walls of the institution. 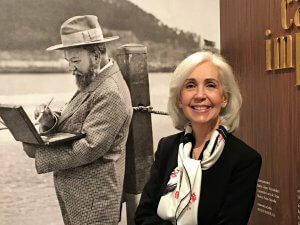 The unprecedented success in New York of that exhibition gave fame not only to Sorolla, but also to the institution. Sales exceeded 200 works and he painted numerous portraits (including US President Taft, art designer Tiffany and Mrs J.P. Morgan). And as a consequence of all this, Huntington commissioned Sorolla to paint the murals that would decorate the Hispanic Library with his Vision of Spain. That was the absolute consolidation of his international career. Q. Chris Riopelle and you are the curators of the London exhibition, what will the public find in this exhibition? A. They will find the ‘great Sorolla’. It is a magnificent exhibition, for the first time all the great works recognised as such internationally will be brought together in one great hall covering the years 1893-1900. There you will see Sorolla the portraitist, with the sensitivity and special delicacy he showed in the works dedicated to his family. The exhibition also shows you the great painter of scenes of sea and beach illuminated by the ardent Mediterranean sun, the different landscapes and Spanish types, the painter of gardens full of privacy, and the exceptional portraitist in the open air. It is really a dream of an exhibition. Q. What paintings never seen before by the public in the United Kingdom have you incorporated into this exhibition? A. The vast majority. And here I want to thank institutions such as the Prado Museum as it is the first time that they have lent their three star works by Sorolla, and the same goes for the Sorolla Museum, in this case with 25 works, an exceptional contribution. Q. Recently you have organised highly successful Sorolla exhibitions in the United States, France, Germany, Portugal … What do you expect from the 2019 exhibition at the National Gallery in London? A. I’m sure it will be another great success like the others! The National Gallery has worked hard to ensure it will. 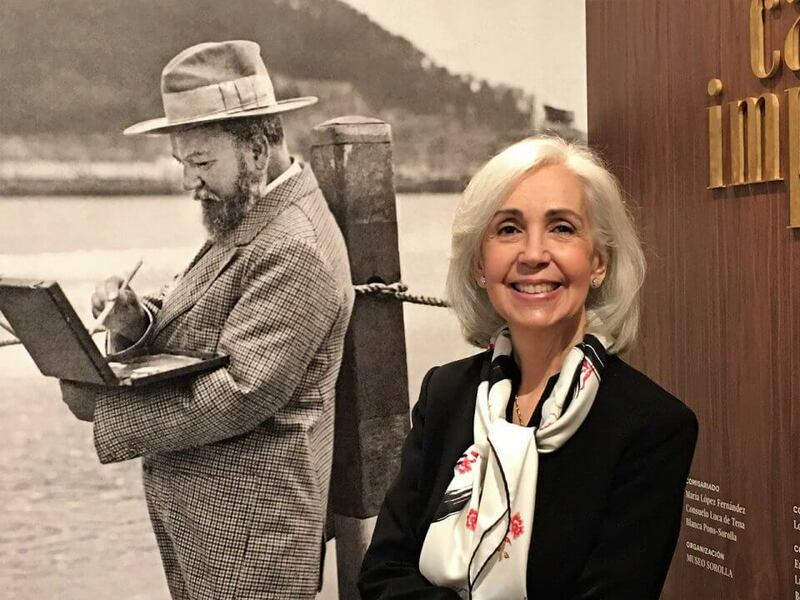 The Spanish Ministry of Culture, on which the Sorolla Museum depends, has also understood this from the beginning and its support and collaboration have been fundamental. 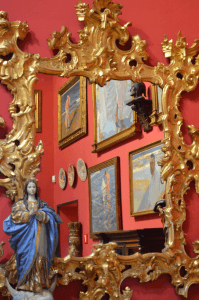 As has also been the case of the Sorolla Museum Foundation and of all the institutions, museums, private collections and sponsors, Iberia and CEEH, which have also supported this project. I want to take this opportunity to thank everyone for their generosity. I also thank Gabriele Finaldi, director of the National Gallery, and Consuelo Luca de Tena, director of the Sorolla Museum, for their work and that of their teams in successfully carrying out this exhibition. And I also know, without the slightest doubt, that my great-grandparents, Joaquín and Clotilde, and their children have guided us in this new project. A. The next dream is to take Sorolla to the Metropolitan Museum in New York, and/or to the National Gallery in Washington. That and the catalogue raisonné are my future plans in which I know that I will always have the support of the Sorolla Museum. I doubt that with my age I can finish the catalogue. However, I feel a duty to continue offering my knowledge and strengthening a team to carry this out. I think Sorolla deserves it. Q. In your opinion, how can the exhibition of the National Gallery serve to strengthen the ties between Spain and the United Kingdom? A. Nothing unites more than culture. I am sure the exhibition in London will contribute to making these ties even stronger. This interview and article (now slightly updated) first appeared in La Revista, published by the British Spanish Society.